Ethereal goddess, daughter of the moon, the quintessential archetype of the female – the High Priestess is magic in its most feminine form. 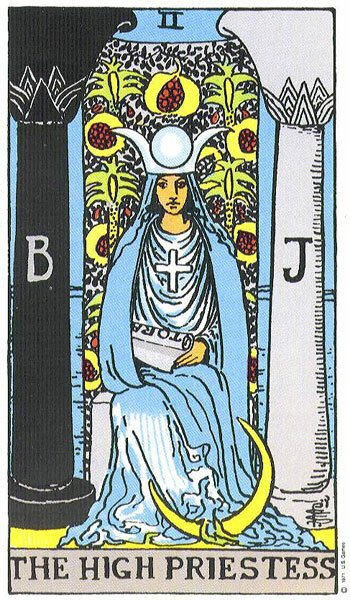 At once strikingly intuitive and secretive, she is the mistress of the arcane, with a profound wisdom that she may or may not choose to share. 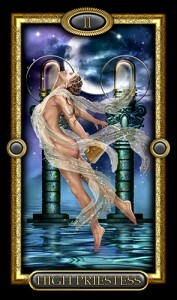 As the gatekeeper to the unconscious, to dreams and mysteries, she casts the spell of night upon the psychic path and opens the traveler up to the richness of the universe. 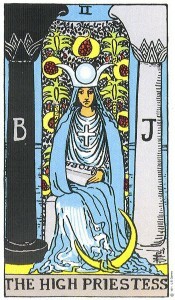 In a reading, drawing the High Priestess can mean that there is some mystery or discovery in your life waiting to be revealed. It can also mean that success comes by listening to your inner voice. You should pay more attention to your dreams and intuition, and be open to ideas that pop into your mind. You may be encountering secretiveness in others, or feel you don’t have the full story. Accept nothing at face value, but work to uncover the deeper, perhaps hidden meaning.